Here is a message I received from a fellow Corvair owner. Sure did bring a smile to me face. HOLY CRAP! This combination is snappy as hell and pulls hard. The exhaust note is sharp and really pops. Every launch from a stop light make me totally forget that I'm driving an automatic. It just leaps and goes! I just moved my PG shift point up another 4 turns of the throttle rod. If this keeps up I'll have to move the trans pivot adjustment to make up for the lost pedal travel. I've already run the timing way past the tab (maybe 18+) and can't detect and ping even at WOT in 2nd going uphill. Torque is WAY up. That's exactly what I wanted!!! Every time I make a small adjustment and take it out, it feels even stronger. I can't wait to see what it feels like after the rings get fully seated. As soon as I get past break in and get the final tweaking done, I post a report. Suffice it to say that I don't regret buying these heads from you one bit. I'm very impressed! THANK YOU! - Reid M."
"Hey Tom, just wanted to give you an update on my new heads. In one word I would say awesome! When I first put them in and went for a drive I was worried since my engine was burning oil during idle and under deceleration in gear. Turns out my oil return line was too small so it was backing up in the turbo and leaking into the hot side. I had the turbo resealed and fashioned a larger return line and now all is good. I'm still getting the weber dialed in before I turn the boost up past 11psi but this thing is running stronger than it ever has and performance in the higher rpm range is much improved over my old heads. They also run cooler which is nice. Overall I am very happy. You do excellent work, thanks Tom." This certainly made my weekend. I took the carb off and used a can of compressed air to blow it out. Reinstalled it on the car...it ran good. VW's. The tech had me install, 160 mains, 200 air correction and 60 idle jets. He also told me how to adjust the accelerator pump for maximum discharge. years ago. She really pulls hard. they were talking about. It may not be two 48IDA's....but it's damn good! Thanks for hanging with me through this ordeal. You have really helped me so much. 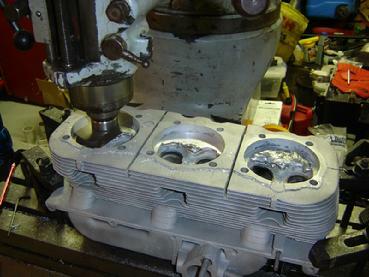 Here is a pair of special heads; 1962 or 63 102 heads I had worked on for a 92MM big bore engine. I decided these would not be good on the engine they came off of. These have the compression ratio too high for normal street use. Maybe on the order of 11:1. I will check the chamber volumes once I finish the chamber machining. I welded the quench, added material between the seats, installed 1.6" intakes and 1.36" exhaust valves. Of course the deep high press seats. New guides. The chambers are opened up to fit the Type 1 VW 92MM cylinders. Intake porting. The exhaust tubes have been removed and are awaiting a decision on either 140 exhaust tubes or angle port. Stock small valve exhaust tubes will not flow correctly on these heads. With a stock late stroke crank this will make a 3.0L. These heads would be great on a 3.0L autocross machine. With the chambers finished and no exhaust tubes these heads will go for $1600.00. To install 140 exhaust tubes add $200.00. For angle ports add $450.00. The correct size for the angle port tubes is 1 3/8" OD. The 1 1/2" tubes will slow down the exhaust velocity. I can also flow these heads if needed for proper camshaft selection. Several pairs of big valve heads are close to finished. Shipping should be available in 2 to 3 weeks. All of these heads have the quench welded, headgasket and valve cover gasket surfaces flycut, new manganese bronze guides, new valves, spring & keepers, viton intake stem seals. Fins are deflashed. Heads are fully assembled and ready to install. Order your set of rebuilt big valve heads before they are gone. Once these are sold I'll be working on another group. Right now I'm not sure what models will be in the works. As always I am in need of GOOD cores. Not something that was found sitting in a field for years or on the bottom of a pond. Badly corroded, mis-matched, abused junk is not worth the effort to rebuild. I have received a pair of "95" heads as cores to rebuild. I still need to clean and assess them. I'm not sure yet if they are 65 or 66. Also in the works is a pair of 62 or 63 "102" heads for rebuild. I'll get all these cleaned this week and post the casting numbers after check out. I have a pair of 61 model heads I'm thinking of rebuilding but I need some feedback. Would anybody be interested in running a pair of early low hp heads with bigger valves on their early car? I'll clean them and post the casting numbers. Let me know if interested. Here are 3 pictures of a head I will be swapping onto the 64 Spyder once I get the EFI running and tuned in stock form. This is an interesting head. Hopefully you guys saw the unusual features before you read this paragraph. A buddy from Austin brought me one head to try out for the Spyder. It was a 1962 to 1963 84hp head PN 3813513. I figured the compression would be close, the ports are the same and the cylinder openings are the same as the 64 Spyder heads. The main difference is the 84 heads use the smaller single valve spring. This head does have the extra material under the spring pocket so machining is possible in order to fit the later dual 1.24" dia. springs. And if I needed to I could weld up the area above the valve box and machine this to fit the turbo drain. So I welded up the quench and flycut, installed new guides and the bigger seats. The head looks really nice. Later my friend found another 3813513 head and brought it to me. This head (pictured) had a lot of corrosion in the left chamber. Due to sitting outside. Rain settled in this chamber and had its way with the aluminum. The pitting was at least 3/16" deep in most of the quench down to the headgasket area. First thing I did was clean the head really well and weld this up along with the remaining chambers. Then flycut and inspect. The bad quench cleaned up as well as the others so this head will work. Now for the interesting stuff. First is the PN. The cast number had been mostly removed although parts can be made out. The 3813513 number had been stamped into the head with 3/8" stamps. Next are the casting differences. This 84 head has the boss for a turbo drain. And... the boss for the temp gauge thermister. Looks like Chevy was out of 84 heads but had several? fresh cast turbo heads on the shelf. They needed heads for a run of 84 hp engines and used the turbo heads as a fill in until the 84 engine run was finished. Or until the cast some more base heads. The cast in part number turns out to be 3817287. So this is both a matching head for the pn on the left side I will use and a match for a turbo engine. Even though this is a 62 to 63 head and my car is a 64. Turbo oil drain boss. Still need to open the spring seats. Here I am opening the exhaust spring seats on my 84 hp heads for my 64 Spyder. This is the turbo head Chevy changed for use on an 84 hp Vair back in 1961 or 1962. Centered up on the original seat, opened to the small seat position. Now setting the depth stop for proper dual spring positioning. To the left you can a completed intake spring seat. Note the undrilled turbo oil drain boss. I'll be machining this next for the 5/8" SS tube I'll use for my drain. 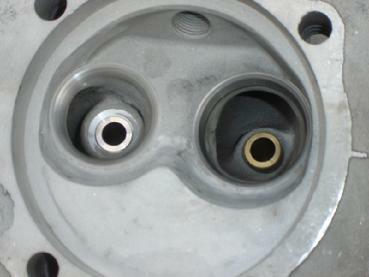 Larger valves installed in the more common small valve heads. NOTE: Guys, please be aware I did not invent this mod. The first I heard about this was in Bill Fishers book "How to Hotrod Corvair Engines" back in the mid 70's. I could not afford a set of 140 heads back then so I added the bigger valves Bill Thomas had installed in his performance heads in the 1960's. This idea faded with the release of the 140 heads. I'm just providing a performance mod for guys that don't want to mess with 4 carburetors, dual exhaust, having to locate 140 sheetmetal, etc. This is an awesome upgrade for the person who needs to have their heads rebuilt. The great thing is the engine will retain a totally stock look but be much more enjoyable to drive. Now you can have much better low and mid range power while using the more common small valve heads. High performance small valve heads include our welded (step removed) combustion chambers, bigger high press valve seats, new bronze guides, larger stainless exhaust and steel intake valves with hard chromed stems, new valve keepers. I also remove cooling fin flash. The chambers are welded in the step area and fly cut back to the stock location there by keeping the pushrod geometry unchanged. 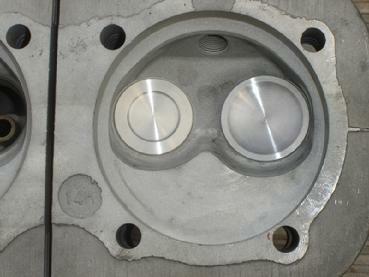 Valve seats are installed with a .008" to .010" interference fit. The hard chromed valves are compatible with the bronze guides. Valve cover surface milled. Heads can be built on 80hp, 95hp, 98hp, 102hp, 110hp and turbo heads. Turbo heads are not welded in the squish area. Contact me for info. Rebuildable cores needed. Typical horse power gains from the basic big valve heads is approx. 20 hp. I will be verifying this figure on a chassis dyno soon. These heads will not make the same hp in the higher RPM's as the 140 heads but will make more torque in the lower RPM's (where most of us run our engines). They are exceptional on a stock street engine. Carb jetting may require a step or 2 size increase. Pricing for these heads, ready to install is $1600.00 a pair plus shipping/handling. Typical UPS charges to ship a pair is $50.00 in the continental US. Here is the data on a stock 110 head. I tested the flow on the center cylinder and had installed intake valves in the outer cylinders to prevent false air from being drawn in. All the air flowing through the port came through the carb mounting hole. Note the low CFM numbers compared to the race head above. Here is the data from my big valve conversion head. The numbers look wimpy. I still need to dyno this set-up. My Monza with the big valve heads feels a lot better than a 4 to 5 CFM flow increase can give. I think. I did not run the test past the 1/2" valve lift. Not many people run cams this radical on a 110 engine. Just interesting data. As far as welding the quench, the turbo heads do not get welded. For a basic turbo street car the compression needs to be kept low compared to a naturally aspired engine. I think Ray Sedman and I are the only guys welding the quench and cutting back to the headgasket position. If I am wrong on this please let me know. The reason we do this is to try to maintain the valve train geometry. By cutting the headgasket to match the step the heads move in toward the engine center and shorter pushrods will be required to correct the geometry. Most of the time the cut to clean up the headgasket surface on a pair of decent heads is in the range of .007". Not enough material removal to require any geometry correction. I have both standard and oversized manganese bronze guides. If the guide bores measure out at the stock size I install standard guides. I add a flow cone to the intakes and shorten the exhaust by .100" This shortening is for clearance to the larger tulip on the 140 exhaust valves If the guide bores are damaged; ie, galled from previous work or dinged up in some way I have a large selection of reamers I'll use to ream the bore until smooth. This is especially important on the intake guides as the vacuum in the intake port can draw oil into the chamber and dilute the mixture. And the engine will use a bit of oil but the source will be very hard to locate. Of course I'll make a custom guide to fit from a guide blank. All guides are installed from the seat side as per Blake Swafford. The intake valves I use are the 140 intakes with the heads turned down on the lathe to 1.52" diameter. The exhaust are run "as is". The intakes get a Viton stem seal. The port blending smooths out the flow from the port to the seat and since the seats are a larger diameter any core shift that might have happened during the casting of the heads is now a moot point. Since I have a flow bench I have found a few areas that will really help the flow in these intake ports. Exhaust too. This porting is an option and costs extra.